What is a Horse Hero? 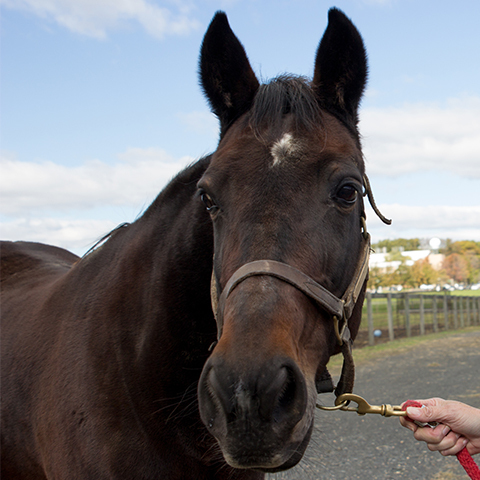 Mares in the research herd at the Rutgers Equine Science Center are Horse Heroes because they serve as participants in the varied research initiatives which positively benefit the greater equine community. The herd consists of Standardbreds, many of which are former racehorses. Horse Heroes in the research herd contribute to knowledge of horse health by assisting equine scientists and students to advance the well-being and performance of all horses and the equine industry. Recent studies conducted at the Equine Science Center include: the effects of age and training on glucose metabolism; how specific gut-derived bacteria could influence the development of laminitis; environmental best management practices on a horse farm; exercise physiology of the older horse; and numerous other studies. By sponsoring a Horse Hero, You Can be a Hero, too! Allie is one of the younger mares in the Equine Science Center research herd. 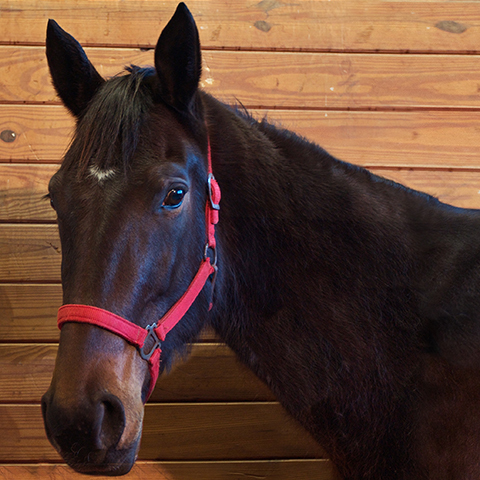 She is very well-behaved on the treadmill and Equi-Ciser™ and enjoys her peace and quiet. Students and faculty discovered just how tolerant she is in 2008 when she developed a corneal ulcer that required frequent medication. She was a wonderful patient who stood for her treatment and recovered perfectly. Throughout history the horse has served as an outstanding model for human medicine. Many human conditions and ailments, such as obesity, Type II diabetes, inflammation, osteoarthritis, cardiovascular function, immune function, nutritional deficiencies, thermoregulation, and aging issues all occur in horses and are being studied effectively via equine models. The standardbred mares involved in the research of Drs. McKeever and Malinowski have helped provided insight into the aging process and also into the response of horses to acute exercise. Baby has proven to be an outstanding research horse. She acquired her nickname due to being the youngest of the group that arrived in 2003, and it has stuck with her to this day. From the very moment the research students began working with her, they knew she was going to be a star. Baby’s life at Rutgers started with a quarantine period. After about two weeks, she became involved with research. Her first treadmill experience was a success, however getting her to canter on the treadmill proved to be quite a task. Though exercise studies may not be her strong suit, she is a champion at nutritional studies because she will eat anything! Some of the research she has participated in at Rutgers includes studies on excess phosphorus in the diet, excess nitrogen in the diet, a three-month vitamin E study, and a joint study. She is exceptional at standing still for muscle biopsies and for one study, she even allowed researchers to draw urine samples from her every two hours from 6:00 pm to 8:00 am. Baby is one of a kind – not only because of her cute face – but also because of her giant heart. Baby not only teaches Rutgers students about science, but also about the loving nature of these animals. Bonnie is an all-star in her herd. Aside from being smart and sweet, she is a wonderful teacher for students who have little horse handling experience. Many nervous students have learned how to groom and trust horses from Bonnie. She is also extremely dedicated to her research studies- no matter how fast the treadmill goes, she will never break her trot stride! 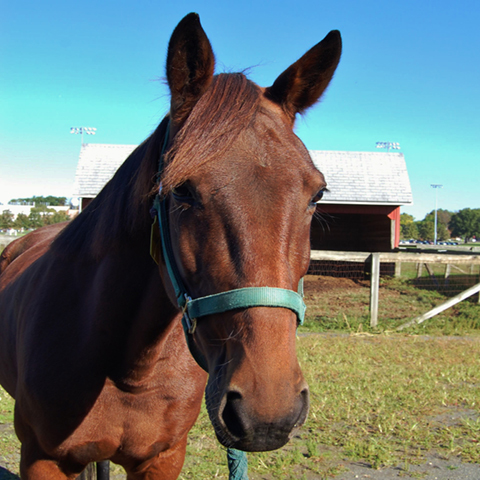 Description: Cascade is an 11 year old mare residing on the G. H. Cook Campus of Rutgers University as a research horse. Cascade trained for a year and raced at the trot in September of 2003. However, her true talent is reflected in the field of equine research. She has been at RU since 2004 and has participated in many equine exercise, metabolism, inflammation and nutrition studies. Cascade is extremely loveable and is quite popular with other horses and humans. Cascade is always looking for attention. If she is pastured near the barn, she spends her time primarily standing by the gate waiting for someone to pet her. She is thrilled when she is chosen for various research and teaching activities. If you sponsor her, she will always look forward to your visit. Description: Born in Cream Ridge, NJ, Frankie was bred to be a harness racing phenomenon. Her sire, Shady Character, earned over $1.2 million and her grandsire, Jate Lobell, earned over $2.2 million in career winnings and was recently inducted into the Harness Racing Living Horse Hall of Fame. Also, Bret Hanover, Harness Horse of the Year of 1964, 1965, and 1966 and one of only nine horses in history to win the Triple Crown of Harness Racing for Pacers, is Frankie's great-great-grandsire on both her sire's and dam's sides. However, despite her royal bloodlines, Frankie never completed her training and was never raced due to her less-than-desirable feet. 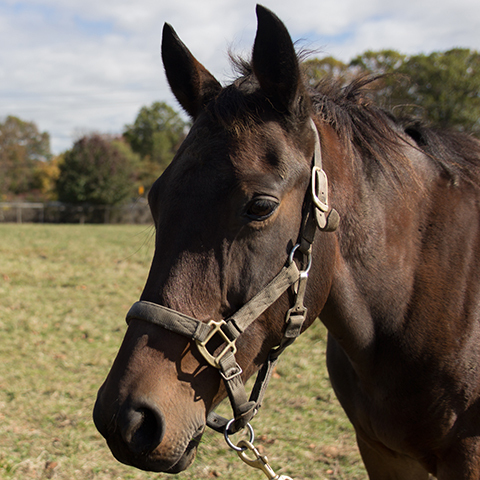 After spending years lazing away in a pasture, at the age of six Frankie was donated by Heritage Hill Farm in Allentown, NJ to the Rutgers Equine Science Center and her career as a research horse began. 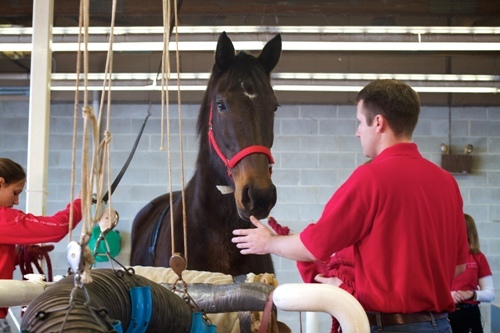 As a research horse, Frankie loves to run on the Equine Exercise Physiology Lab’s state-of-the-art High Speed Treadmill and Equi-Ciser™ for exercise tests of varying length and intensity, which help students and researchers understand the physiological processes involved in exercise. In both the Spring and Fall of 2010, Frankie participated in several nutritional studies examining the relative absorption and excretion of a variety of nutrients, such as nitrogen and phosphorus into the environment. Frankie particularly enjoys nutritional studies, as they often involve getting to eat some very tasty grain! During the periods of time when she is not busy participating in research studies, Frankie enjoys spending her time unwinding in her paddock and frolicking with friends Maggi and Baby. Frankie’s favorite activity is eating, and she’s often seen anxiously waiting near the hay feeders in her field in anticipation of a flake of hay being placed in front of her. As the alpha-mare in her paddock, Frankie uses her size, all 16 hands of it, to make sure the other horses are doing what she wants them to do. During the morning and afternoon feedings, Frankie guards the feeder where hay will be placed first to ensure she gets the very first bite. If the research horses need to be brought in for grooming, research procedures, or a visit from the farrier or veterinarian, Frankie pushes to the front of the herd to ensure that she is brought into the barn before anyone else. Whether relaxing in her field or running an exercise test on the treadmill, in her five years at the Equine Science Center, Frankie has taught dozens of students the importance of basic horse care such as grooming, exercise, training, nutrition, and research in maintaining the health and vitality of today’s horses. 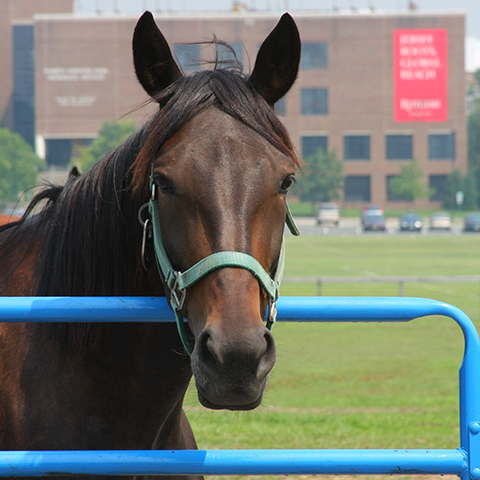 Description: Since “Jackie” arrived on the G. H. Cook Campus at the Rutgers Equine Science Center in 2006, she has been a part of several different research projects including, joint inflammation studies, industry product testing, and Beta-carotene, vitamin E, and microhydrin (antioxidant mineral complex) studies. Jackie also has been busy taking part in a variety of environmental and bedding studies and in various pilot studies of graduate students. Many wonder why she is called Jackie when her registered name is Caesars Juliana. When Jackie was only three years old, Dr. Carey Williams went to Heritage Hill Farm to look at Winnie and Frankie as potential research horses. While visiting Winnie in the field of about five mares she noticed Jackie hanging around looking curious. After petting Jackie and realizing what a sweet horse she was, Dr. Williams jokingly asked if she was able to be donated as well. Heritage Hill Farm checked with Jackie’s owner and he said yes! Only knowing Jackie’s mothers name, Nuclear Jackpot, and that she was an 2003 foal, the nickname Jackie stuck. When Jackie came to Rutgers she only knew how to be led and have her feet trimmed; everything else was new and Jackie took to it like a champ! Now Jackie is in training to become the next treadmill demonstration star. If you sponsor Jackie, you just may see her running during a treadmill demonstration in the near future. Description: In the spring of 2014, Diane and Joe Quail reached out to us at the Equine Science Center after their daughter recommended that they contact us in regard to finding a new home for their 8 year old mare that they wanted to retire from racing. It so happened that Dr. McKeever was looking for some new Standardbred mares about Janie’s age so she entered the research herd at RU! Janie, is one of our stars, working diligently on both the Equi-ciser and the high speed treadmill as she participates in our cutting edge research, designed to improve the health and well-being of all equine athletes. Janie raced 153 times, placing first 13 times, earning $57,000. Her fastest time for the mile was at age three when she paced in 1:57.3 on a half-mile track. Description: Maggi was born in New Jersey at Stonebridge Farm in Marlboro. Although her sire and dam had successful racing careers, the racing industry was not for her. Maggi's owners decided to give her the opportunity to have a new career. She was given to the Standardbred Retirement Foundation in December 2005 with application papers that stated, “Not meant to be a racehorse”. Luckily she was adopted only a month later by Rutgers University as a research horse. As a research horse, Maggi is given the chance to live happily out in a field and be loved by the research team and farm crew. She helps teach students about handling, grooming, and feeding horses besides her many research duties. Her research involvement includes working on the High Speed Treadmill at the Equine Exercise Physiology Lab to provide interactive learning for students and researchers. This experiential learning environment allows hands-on experience and more detailed studies to be performed. 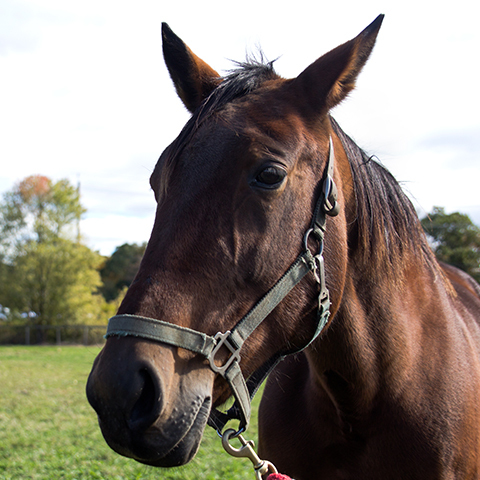 Everyday Maggi helps to achieve the mission of the Rutgers Equine Science Center in enhancing horse care through her use in research and education. Maggi recently participated in a study that used a high protein diet. This study was done to see how such diets would ultimately affect excretion of nitrogen and impact on the environment. During the study, Maggi contributed to the study as a treatment and control horse. Maggi also participated in a pilot study for one of the Rutgers graduate students. This study involved muscle biopsies to assess Heat-Shock Proteins in muscle. Right now Maggi is refreshing her training on the treadmill and prepping for her next research assignment. Description: Let Em Whirl, more lovingly known as Queenie, was adopted from the Standardbred Retirement Foundation (SRF) in October of 2003. Bred and foaled in Pennsylvania, Queenie has two white rear socks. The name Queenie is becoming for her personality; despite her small stature of only 15 hands, she makes herself known amongst the other horses by having a large personality. 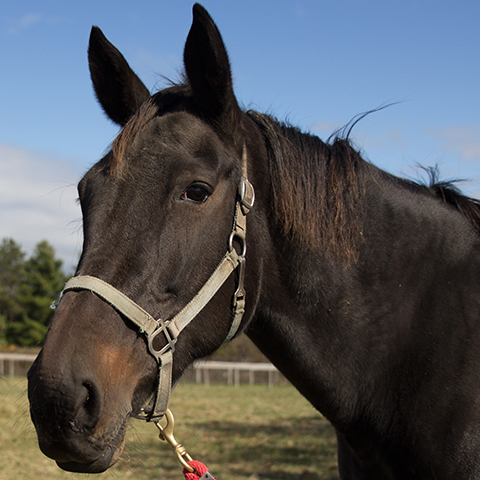 She is not aware that she is one of the smallest, Standardbred research horse on the G. H. Cook Campus farm. Before retiring at SRF and coming to Rutgers, Queenie raced twice as a pacer in 2002. Unfortunately she did not place in the earnings either time. She is very eager to run on the high-speed treadmill for research studies and happens to be one of the fastest girls maxing at about 20 miles per hour before tiring. Queenie has participated in almost every study conducted since she arrived at Rutgers. It did not take her long to get acclimated to the treadmill. Her typical east coaster attitude, always in hurry and eager personality traits, makes her easy to train and a great candidate for any research study. The excitement she exhibits when it comes to performing tasks however, makes her somewhat difficult to stay occupied while in a stall. She would much rather be on the treadmill than out in the paddock with her fellow research horses. Description: At Rutgers, Stardust enjoys playing in the fields, eating hay, and playing hard to get with students and staff members. For her, life is a game that she was born to play, and she enjoys every minute of it. Though playful, she is also very sweet and has even stolen the hearts of a few people who once questioned her elusive ways. Coming from great bloodlines, Stardust was born into a world where she was expected to be a great Standardbred racehorse. Unfortunately she was not structurally fit for the task. She was born with one leg turned inward causing her to be “pigeon-toed”. Because there is not a lot of use for a racehorse that cannot race, Stardust had limited options for her future. 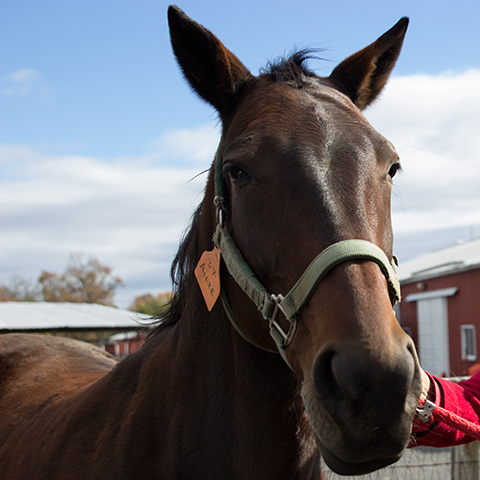 The Rutgers Equine Science Center gave Stardust a second chance at a productive life. Here, Stardust is a research mare providing students an opportunity to learn about exercise physiology in the treadmill laboratory. When it is time for Stardust to work on the treadmill, she willingly walks on and paws at the treadmill belt in anticipation until it starts moving beneath her hooves. 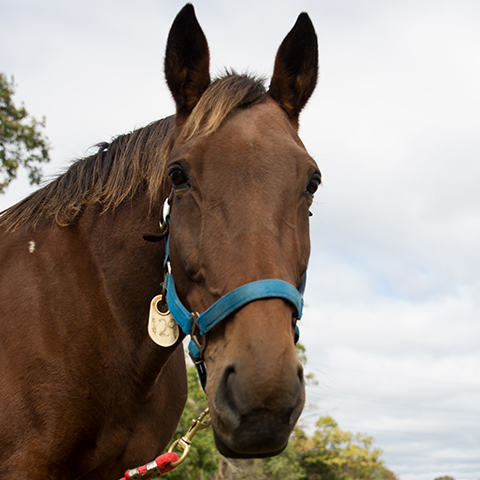 She has never been lame since arriving at the university, and she even holds the position as one of the fastest, hardest working horses in the research herd. Moreover, she has a history of overheating because she will not stop running even when she is fatigued. In her mind, a racehorse never gets tired. In a recent study where Stardust performed a graded exercise test on the treadmill, her heart rate reached a maximum of 230 beats per minute. Giving it her all, she ran at a steady 11 meters per second (25 miles per hour) until she hit her maximum speed for a very brief moment at 12 meters per second. That is almost 30 miles an hour! 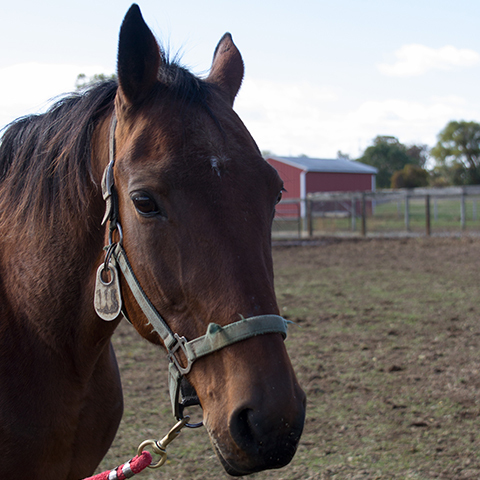 Only a handful of other horses on the Rutgers farm have reached that speed. Stardust’s racing pedigree shines through as soon as she steps foot onto the treadmill; every time she runs, it’s her very own race. Description: Win For Life, barn name Winnie, is beloved among Dr. Williams’s standardbred research horses. Part of Winnie’s popularity is due to her willingness to cooperate with students. She’s known as one of the more easygoing “girls” to work with regardless of whether you’re trying to take blood samples, insert a jugular catheter, run her on the treadmill, take a muscle biopsy, or lead her in from the field in the afternoon when she’s hungry. 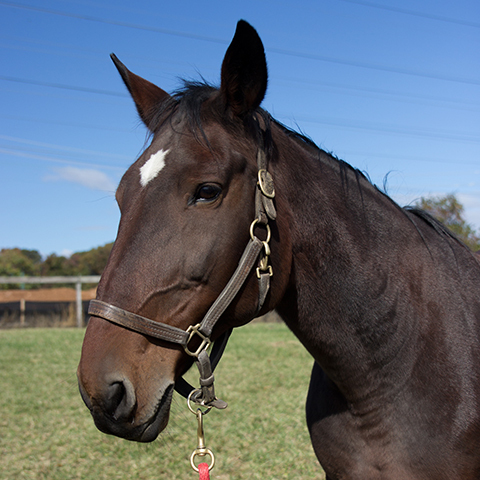 Winnie is one of the biggest mares at Rutgers with her last recorded height of 15.3h and weight of 600kg as of Fall 2010. Although not one of the public superstars, she is a winner hands down within the university. Winnie is consistently the best behaved mare and has a temperament that coincides with her beauty. All of Dr. Williams’ horses learn to run on the treadmill for exercise physiology research such as studies of the effects of various feed additives on oxidative effects in muscle. Winnie has been with Dr. Williams for a long time and is cooperative about running on the treadmill, as well as she everything else she’s asked to do. 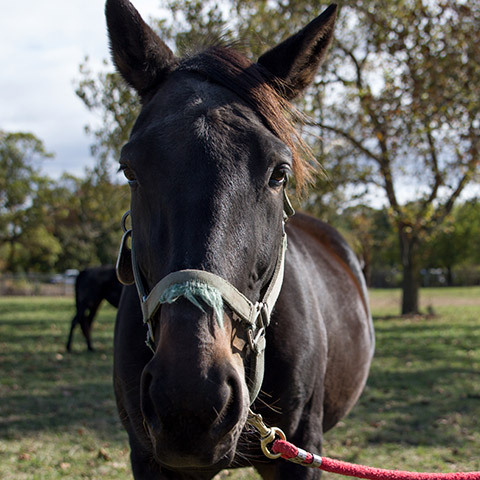 Her sweet nature means that she’s often used as a “practice” or “safe” subject for students who aren’t familiar with working with horses before coming to Rutgers. Recently, she’s been involved in nutrition research to help determine the effects of a high-protein diet on nitrogen excretion in horses. Many of the other mares got excited or impatient in the mornings or afternoons when they knew that their food was on the way, but Winnie stayed calm and patient. Winnie’s sire and dam earned a total of $1,974,628 between them on the track. Though Winnie doesn’t have this record, running 20 miles per hour on a treadmill for equine science instead of purses has helped her contribute even more to our general knowledge of horse health. It’s possible that Winnie’s three foals and other equine athletes will be able to lead longer, more successful careers and lives due to Winnie’s efforts. In the meantime, Dr. Williams’ research students will continue to appreciate her for being one of the steadiest horses on campus!